As singers, we are used to performing when we’re not at our best. We regularly rehearse and perform while jet-lagged, sometimes just hours after flying across an ocean. We have all sung while sick. As a mother of two, I’ve sung through two pregnancies, lots of morning (all-day) sickness, and through those sleep-deprived early years of parenthood, feeling far from my best. I’ve sung an opera role from the orchestra pit two hours after falling down a flight of stairs and badly injuring both legs. I’ve sung through a miscarriage 7,000 miles from home. Only once in my 17-year career have I been so ill that I cancelled a performance, and in that instance I could barely speak, let alone sing, so there was no doubt I’d made the right choice. You could argue that all these experiences prepared me well to juggle cancer treatment and my singing career. In a certain sense, they did. In truth, nothing could prepare me for the life-altering experience of being diagnosed and treated for breast cancer. From the moment I asked my family doctor to examine me because something “seemed off,” I knew the news was bad. None of the medical professionals were able to keep a poker face as they palpated the lymph nodes under my arm. Not one of them said “it’s probably nothing.” It was cancer from the start – the only thing we had to ascertain was the stage, grade and treatment plan. Because of my relatively young age at diagnosis – I was 42 – most people I told would cheerfully chirp “Oh, but you’re catching it early!” In fact, this was not true. I was diagnosed at Stage 3, and the cancer had spread extensively to my lymph nodes, and was multifocal, which meant that I had a primary tumour and several satellite tumours. This meant that I would undergo four months of chemotherapy, followed by surgery, followed by a second surgery, followed by five weeks of daily radiation therapy. In total, I was in active treatment from January 4 to August 31, 2018. 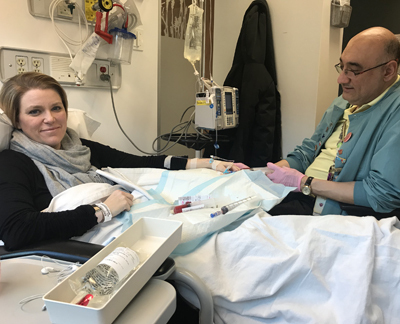 Facing down cancer treatment is daunting enough – trying to determine what to do about my career was difficult as well, with so many unknowns. How sick would I be? Should I cancel all my singing engagements for the duration of treatment? Should I keep my diagnosis a secret? The first cancellation came almost immediately, as I had to clear my schedule to undergo all the diagnostic scans and biopsies. The difficulty in this instance was that I needed to procure a doctor’s note to cancel, one that conveyed the seriousness of the situation but didn’t actually reveal what the illness was until we were 100% sure. I kept a high-profile engagement the week before the testing and diagnosis, and I can say now with certainty that it was a terrible idea. When I wasn’t trying to behave normally during rehearsals and performances, I was curled up in a ball in my hotel room, sobbing. I couldn’t eat or drink. Would this be my last engagement? Would I live to see my children grow up? When all was said and done, I ended up being incredibly lucky. Chemotherapy was not easy, but I stayed on my feet and sang through it. I had an infusion every three weeks, and the week after infusions I did not sing – not only because I felt generally wretched, but because I was given high doses of steroids, which are generally not friendly to the voice. However, I did manage to sing concerts in the second and third week after infusions, and there was a fair bit of travel involved – Calgary, Rotterdam, Brussels, Indianapolis, Washington, D.C., Kitchener-Waterloo, and Cleveland. I wore a mask when flying and doused everything I touched with hand sanitizer – as a result, I maintained quite decent health through all of my concert engagements. Singing concerts felt like taking a vacation from cancer world, and I thoroughly enjoyed myself during all of them. I did struggle with breath control towards the end of chemotherapy, as I was becoming progressively more and more anemic. Anemia also led to spells of dizziness, but my colleagues were wonderful, watching out for me, offering a hand if I needed it, and making sure I didn’t fall or faint on stage! From the start, we knew I’d have to cancel the long opera engagement I had scheduled in Chicago, which was emotionally difficult. 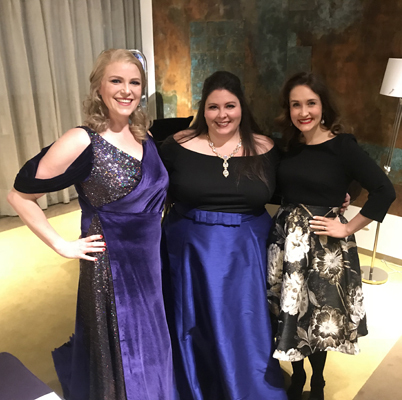 I spent the early years of my career as a young artist at Lyric Opera, and the first principle role I was engaged for with the company was Marguerite in Faust – I had been scheduled to return to the company in a new production of the same opera. After several long discussions with my manager, I decided to be very specific and honest about why I was cancelling the engagement. I wanted control of the narrative, leaving no doubt in anyone’s mind that I was cancelling for a good reason. 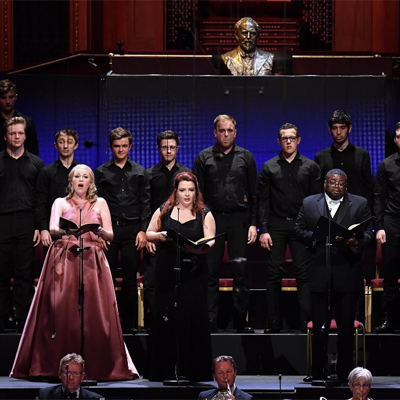 When vague “health reasons” are cited in operatic cancellations, doubts are often cast by both administrators and audience members alike, and speculation about a person’s vocal health is often rampant. This was exactly what I didn’t want, so the press release made it clear that I was undergoing treatment for cancer and planned to return to singing full-time once treatment ended. I found all of the symphonies and opera companies I was engaged with to be incredibly understanding and supportive, allowing me to cancel if it was necessary, and welcoming me to perform if I felt I was capable, even when I couldn’t say with any certainty that I’d be okay to perform until days before the engagement. For this I am truly humbled and grateful. There were many bumps in the road, however. Scheduling, especially for surgeries and radiation, became quite complicated. Generally, the hospital is accustomed to scheduling the patient whenever they find it appropriate, and the patient rearranges their life and shows up at the appointed times. Trying to get my first surgery scheduled so that I could avoid cancelling three weeks of work was complicated – at one point I was given a date, told it was final, and had already phoned my manager to cancel a conflicting engagement when I was notified the surgery had been moved to my requested date – there was quite a scramble to “un-cancel!” Less than 48 hours after singing Beethoven’s Ninth with the Cleveland Orchestra I had my first surgery. Less than two weeks after surgery, I was gowned up, on stage in Montreal singing Beethoven’s Ninth yet again! That work ended up being a real touchstone piece for me through my treatment year – 11 performances in Canada, the U.S., U.K. and Germany. In between two weeks of performances with the Vancouver Symphony in June, I flew home to get pathology results from the first surgery. Again, the minute I spotted my surgeon’s face, I knew the news was bad. I flew back to Vancouver in a daze of sadness, and less than 24 hours after I returned home following a week of Mahler’s Symphony No. 2 performances, I was back on the operating table undergoing a mastectomy and removal of 18 lymph nodes. This surgery was a blow both physically and emotionally, because there was so little time to prepare myself emotionally for the physical loss, and because recovery was painful and difficult. As a type-A personality, I’m used to pushing through discomfort and exhaustion and I don’t feel good when I’m not being productive. Post-surgery, I was in bed for a solid week, which did not suit me one bit – I was bored, cranky from the pain, and lonely. Thank goodness for Netflix! After that week, as I began to get up and moving around the house, healing progressed nicely and at three weeks, I was given the okay to return to normal activities – and to begin running again, news that was most welcome after two months of surgical recoveries! 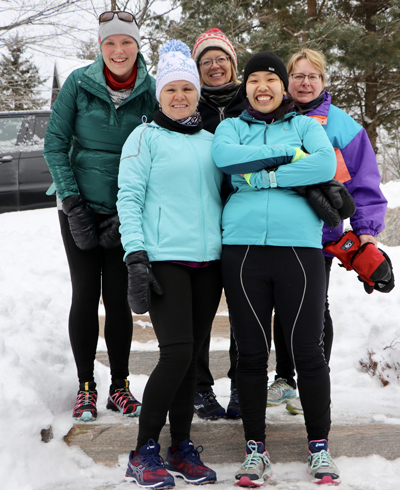 People were surprised to learn that I kept up an exercise regimen throughout treatment. Not only does exercise increase survival odds for cancer patients , it is also an incredibly effective fatigue and exhaustion-buster. Although some days I had to drag myself to the gym or out onto the street for a slow walk, after a workout I always felt better. It also really helped with the joint and muscle pain caused by the chemotherapy drugs. My running pace slowed to a crawl and then to a walk, but I kept moving forward. I was able to start running three weeks after my second surgery, and I ran through radiation treatment as well. I even completed the New York City Marathon on November 4, 2018 – a day that also happened to be my 43rd birthday. 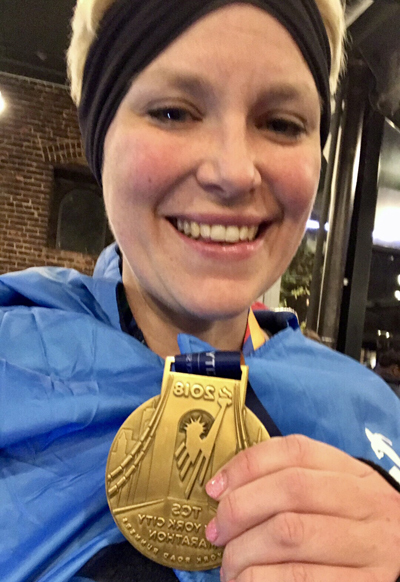 It was my slowest marathon to date, and a very painful one, but I wasn’t about to let a little cancer rob me of the chance to run a race I’d been looking forward to for over 10 years – the number of years it took me to get an entry via lottery! 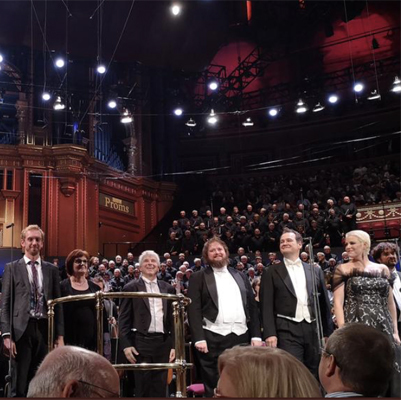 Radiation treatment was bookended by two really fun concerts at the BBC Proms in London. It was nice to feel like I was in the home stretch of treatment, and although going to the hospital every day was time consuming, I used the time spent commuting to treatment on the GO train and sitting in the waiting room to study music for upcoming gigs. 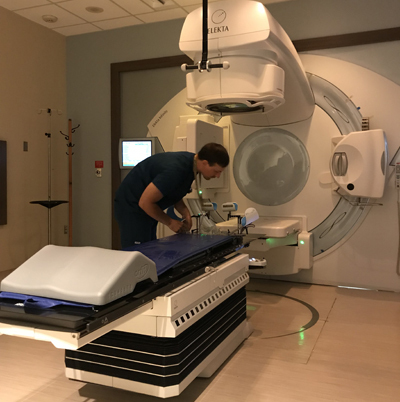 The first treatment nearly gave me a panic attack – the linear accelerator is a terrifyingly large machine – but the treatment itself was painless, and I was lucky that my side effects were minimal. The day I finished treatment, a few hours after striking the gong, I was on a red-eye headed for Glasgow to rehearse Britten’s War Requiem. 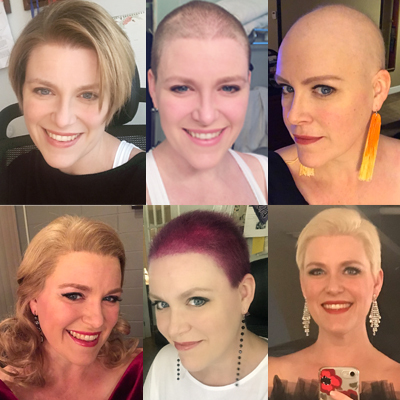 I celebrated my first post-treatment performance by going wig-free on stage – a marvelous feeling! First wig-free performance – a marvelous feeling! Speaking of wigs – I had major advantages when it came to chemotherapy hair loss that most cancer patients just don’t have! Sharon Ryman, head of wigs and makeup for COC, made me a beautiful custom wig for performances. There was no better feeling than “looking like myself again,” and that’s exactly what I felt when I put on my wig for performances. She also gave me a short haircut a few weeks before chemo started, so I could say goodbye to my hair in gradual stages. The idea of large chunks falling out was unappealing to me, so we decided to have a little fun with it – when my hair started to fall out, my whole family gathered together and my husband and mother shaved my head for me! Later in the year, when my hair started growing back, I experimented with crazy colours, dyeing it magenta and platinum blonde. If I had to lose it and grow it back, I was determined to really explore all the possibilities! For me, the most annoying part of hair loss (and the part the movies never get right) was that I lost my eyebrows and eyelashes. Fortunately, years of stage makeup application helped prepare me for the daily ritual of replacing brows with pencil and the application of false lashes – something that cancer patients often have to learn in special classes offered at the hospital. 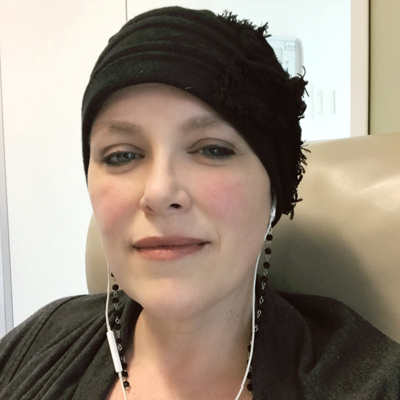 The hairy reality of chemo: I was determined to explore all the possibilities! I didn’t emerge from my cancer odyssey a completely changed woman. In many ways, life is exactly the same – still a complicated mixture of joy and pain, exhilaration and frustration. I could only laugh when, two weeks after finishing treatment, I fell, broke my arm, and ended up needing surgery the next day, bringing my total to three surgeries in as many months. 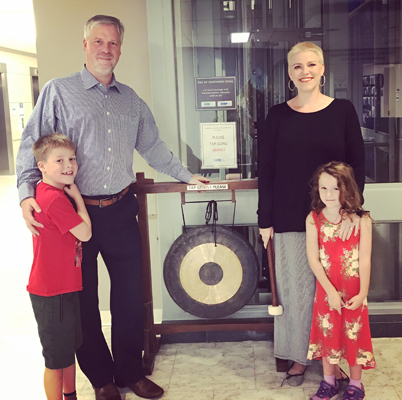 Life continues to throw challenges my way, both personal and professional – I continue to be challenged by life in many of the same ways I was challenged before cancer. What this crazy year did give me is the knowledge that I can handle almost anything that comes my way. The doubts and lack of faith I had in myself before cancer are gone. I know that I am strong, that I can survive pain, doubt, and loss, and that I can choose not to live each day in fear of what comes next. This odyssey also brought a lot of love into my life, and I marvel each day at how lucky I am to have family and friends who supported me from start to finish and beyond. Not a day goes by that I don’t reflect on that. I appreciate all of the banalities of life a lot more, because I have a constant sense that, had I not been lucky, I wouldn’t be here to experience them right now. I’m thankful that my voice survived the journey and that I continue to have the chance to use it! 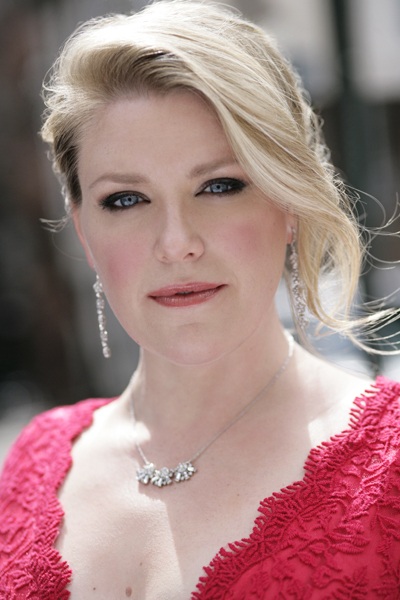 Erin Wall is on stage at the COC as Chrysothemis in Elektra, until Feb. 22, 2019. Inspirational! Thank you and bravo, Erin Wall! Keep singing and spread your buoyant spirit. Dear Erin, Believe it or not, just TODAY, Cindy and I were saying that we need to call or write to Roberto to ask how you are doing. After reading this, we are in AWE of your courage, tenacity and strength. You have our consummate admiration and wishes for continued healing and opportunites to share with the world your extraordinary artistry. With love to you and Roberto..